With our offices in Wheat Ridge, CO Boca Raton, FL, Security Camera King has been on the forefront of each of these new amendments to the cannabis business. What we have collectively experienced is a long, drawn-out, complicated set of regulations that call for strict compliance surrounding surveillance of both medical and recreational dispensaries as well as associated grow-houses. Nevada only implemented their newly passed law allowing recreational use of marijuana as recently as July 2017. 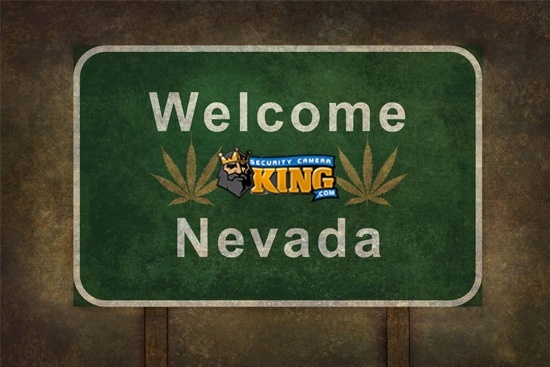 With the recreational regulations just now being fully underway, we have seen a steep rise in marijuana dispensaries throughout the state of Nevada. What we have learned in our experience with assisting the opening of dispensaries in states already allowing the sale and use of recreational marijuana is that the security measures differ between dispensaries for medical marijuana and dispensaries for recreational marijuana. The latter of the two comes under much stricter regulations for the security of the property and product. Here are what the current marijuana laws in effect in Nevada have to say about surveillance and security monitoring for a dispensary or grow house. Prescribe the form and any additional required content of registration and renewal applications submitted pursuant to NRS 453A.322 and 453A.332. (a) The manner of protecting against diversion and theft without imposing an undue burden on medical marijuana establishments or compromising the confidentiality of the holders of registry identification cards and letters of approval. (b) Minimum requirements for the oversight of medical marijuana establishments. (c) Minimum requirements for the keeping of records by medical marijuana establishments. (d) Provisions for the security of medical marijuana establishments, including, without limitation, requirements for the protection by a fully operational security alarm system of each medical marijuana establishment. These are only the released regulations for a medical marijuana dispensary. As you can see, the language is difficult to decipher and allows those regulating the sale of marijuana a lot of leeway in deciding what is and is not in compliance. At Security Camera King we have found specifically that this lax manner in defining security regulations is exactly what has come to be the downfall of many dispensaries hoping to create their own stand in the marijuana revolution. We supply all security and surveillance equipment that might be needed for your Nevada dispensary or grow house. There is no reason you should feel that this is a venture you have to go into blind and alone, and we at Security Camera King implore you to seek us out to help keep you and your marijuana business in compliance with the latest regulations so that you can maintain the integrity of your legitimate business. Security Camera King is a security and surveillance equipment distributor that supplies the needs of all those in search of quality security products. We partner with e-Line Technology and work directly with the best manufacturers in the security industry and guarantee our Nevada dispensary security cameras and surveillance products with our own promise that we would never sell anything that we would not use ourselves. Due to our relationship with these manufacturers, we are able to keep the cost of our equipment lower than our competitors. As a fully integrated security business, there is nothing in the security industry we are not able to offer up our expert knowledge and advice for. For a full look at our entire security equipment catalog, check out our online store at Security Camera King. For further information regarding marijuana dispensary laws and Nevada dispensary security cameras follow our link at Cannabis Compliance. Contact Us with any additional questions or inquiries you might have, and let us help you build your own successful stand in the marijuana revolution.